Welcome to the New York Wildfire & Incident Academy’s first spring prescribed fire academy. This academy is designed to teach individuals and teams how to properly conduct prescribed burns safely and effectively. All academy classes are held at Brookhaven National Laboratory in Upton, Town of Brookhaven, Suffolk County, New York. Detailed information on courses, dates, times and housing options can be found on the academy brochure on the Wildfire Academy page found on DEC's website. All registrations for both the Spring Prescribed Fire Academy as well as the March 2013 course offering must be sent in by mail/e‐mail/fax. 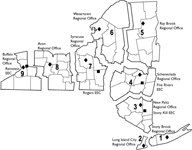 Completed applications can be e‐mailed to nywima@pb.state.ny.us or faxed to the Academy's office at (631) 769-1772. Ever wonder what to do with unwanted paint cans, batteries,and pharmaceuticals? Not sure what to do with outdated computers? Protect your family and pets by learning how to store and dispose of hazardous waste found in your home!